Begin this vacation with an overnight in Alaska's largest city. Experience our luxury domed rail cars traveling round trip from Anchorage. With a night at Denali National Park, and a night at Mt. McKinley Princess Wilderness Lodge there’s ample time to experience the abundant wildlife and to visit viewpoints for the "Great One". Then, venture back to Anchorage aboard luxury rail. For a more adventurous trip, check out some of our optional activities in each location like flightseeing, river tours and fishing excursions. We'll pick you up at the airport and transfer you to your Anchorage hotel. Spend the afternoon on your own exploring Alaska's largest city or purchase an optional excursion from our friendly tour desk. Overnight Anchorage hotel. Travel north from Anchorage to Denali aboard luxury railcar, following the route of the Alaska Railroad. Journey between the mountains of the spectacular Alaska and Talkeetna ranges and past sparkling rivers through the legendary Matanuska Valley. By afternoon you’ll arrive in Denali National Park. 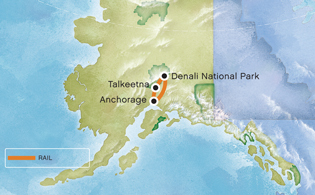 Visit the tour desk and learn about the optional activites that make Denali unique, like Mt. McKinley flightseeing and Husky Homestead. Overnight Denali-area hotel. You'll continue your journey to Mt. McKinley/Talkeetna on our domed railcars. You’ll stay at the beautiful Mt. McKinley Princess Wilderness Lodge, featuring quite possibly the most awesome view of the "Great One" in the state. Once there, you’ll have time for optional activities such as river tours and guided hikes. Overnight Mt. McKinley Princess Wilderness Lodge. Enjoy a morning at leisure or continue to explore the area on an optional excursion. Later, re-board a glass domed railcar and begin the return journey to Anchorage. Upon arrival in Anchorage, transfer to your hotel. Overnight Anchorage hotel.